With writer-director Jennifer Westfeldt’s (Kissing Jessica Stein) Friends with Kids opening March 9, we’ve been provided with seven clips from the very funny comedy. Boasting an incredible cast featuring Westfeldt, Adam Scott, Jon Hamm, Kristen Wiig, Maya Rudolph, Chris O’Dowd, Megan Fox and Edward Burns, Friends With Kids centers on a pair of thirtysomething best friends (Scott and Westfeldt) who observe the toll that having kids has taken on the couples they know and resolve to bypass that stress by having a child and then date other people. Right after the film premiered at last year’s Toronto Film Festival, I landed exclusive interviews with Megan Fox, Jon Hamm and Adam Scott. Just click the links to read or listen to them. Hit the jump to watch the clips. 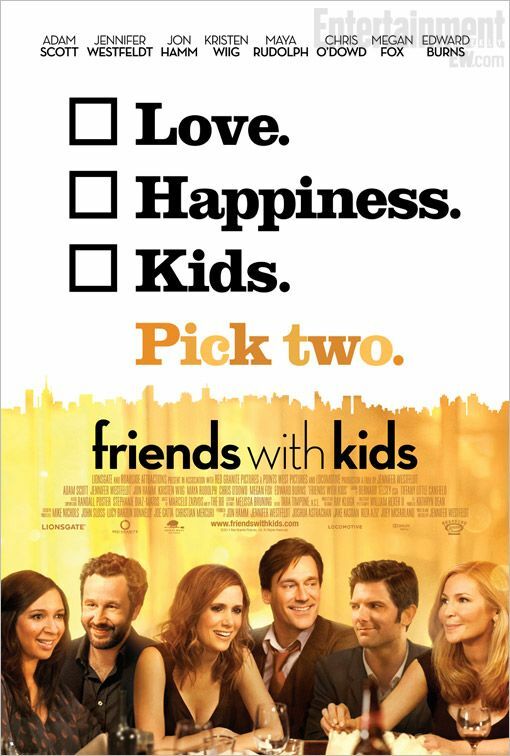 Friends With Kids, written and directed by Jennifer Westfeldt, is a daring and poignant ensemble comedy about a close-knit circle of friends at that moment in life when children arrive and everything changes. The last two singles in the group – Westfeldt and Adam Scott (Parks and Recreation, Stepbrothers ), observe the effect that kids have had on their friends’ relationships and wonder if there’s a better way. They decide to have a kid together – and date other people. There are big laughs and unexpected emotional truths as this unconventional ‘experiment’ leads everyone in the group to question the nature of friendship, family and, finally, true love. Friends With Kids is a Red Granite Pictures presentation of a Points West Pictures and Locomotive production. It was produced by Westfeldt with Jon Hamm, Joshua Astrachan, Jake Kasdan, Riza Aziz and Joey McFarland. Executive Producers are Mike Nichols, John Sloss, Lucy Barzun Donnelly and Joe Gatta.